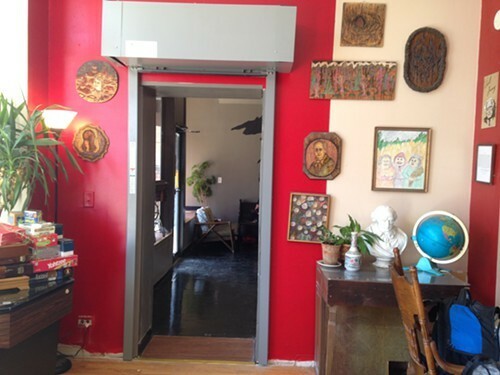 Logan Square coffee shop Cafe Mustache officially opened its second room, which sits in an adjacent storefront at 2313 North Milwaukee Avenue. Owners Kerry Couch, James Stieglitz, and Ralph Darski (of rock outfit Rabble Rabble) have been working on Cafe Mustache's expansion for about two years. 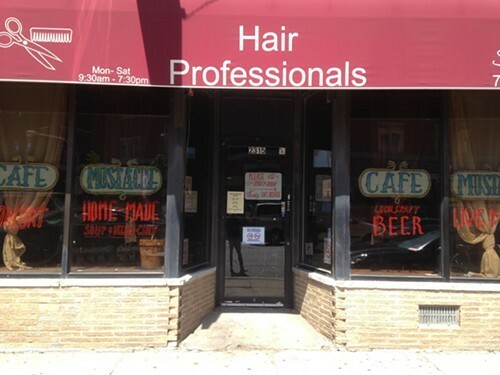 In May 2013 the owners publicly announced plans to take over the storefront next door, which used to house a hair salon, by launching a Kickstarter campaign to cover the costs for permits and hire an architect and contractor to build out the space; the fund-raiser reached its $20,000 goal by the end of June. (The cafe also received some additional financial help from the Chicago Community Loan Fund.) Now, after waiting for the final licensing and inspections, Cafe Mustache's expansion is open to the public. The owners wanted to expand next door in part to offer more events; the shop hosted a series of shows throughout the years, with musicians setting up in a corner of Cafe Mustache for intimate performances. The new space is primed for events: it's got a stage near the back of the room, and a PA system to go with it; a service bar; and plenty of the comfortable charm of Cafe Mustache's original storefront. "We're not like all of the sudden just a bar—we're still a coffee shop, we still serve food all day through the night," Darski says. 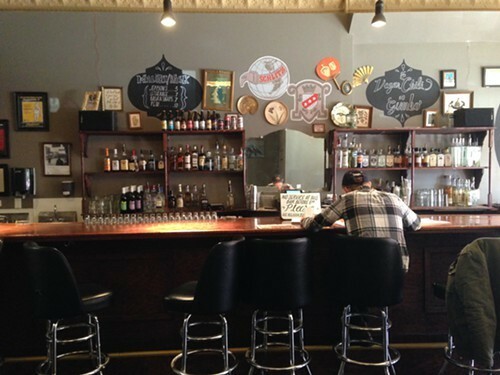 "Obviously we'll have events, but it's not like all of the sudden we're just a bar-venue. We're more than that—always have been." Darski says Cafe Mustache is expanding its monthly events series now that the new space is open. It will host the Ratchet Series, an ongoing jazz event that launched at the Skylark in 2007 and will take place on the first Tuesday of the month; local a cappella group Blue Ribbon Glee Club will also take over the stage once a month. Darski says he hopes to set up more shows for the weekend nights—specifically Thursday through Saturday—and Sunday will be left for something different. "Sundays we're doing karaoke," he says. Cafe Mustache has also expanded its hours—it'll be open from 7 AM to 2 AM every day, and workers will serve on different storefronts depending on the time of day. "Before 6 [PM] you get served at the cafe side—there's a full venue for the day, the Wifi's on," Darski says. "Then at 6 you switch. 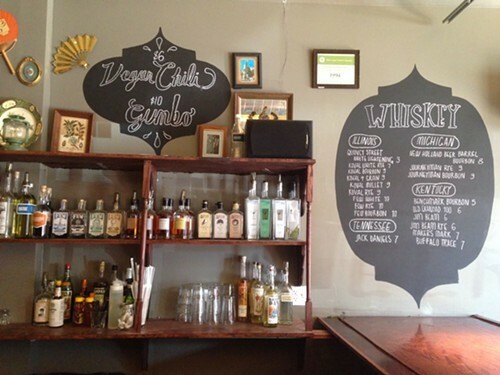 The Wifi shuts off, the menu gets changed to the nighttime menu, which has different food options—more drinks and stuff like that—and you get served on the bar side." Both storefronts will remain open during business hours, and the stores are connected by a couple fire doors built out during the expansion; one door is for customers, the other sits between the service counters on either side, which meet near an alcove containing Cafe Mustache's large vinyl collection. 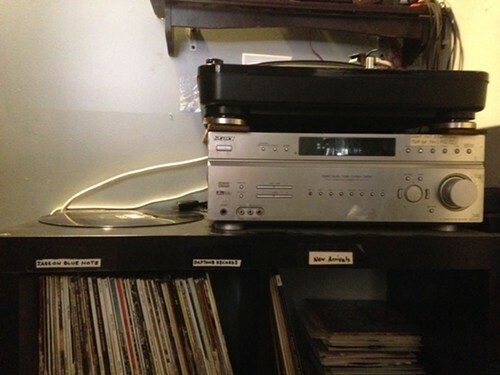 The shop still sells records and cassettes from local artists on the cafe side, and Cafe Mustache's proclivity for vinyl spills over into its event programming. One of the events for the new space's inaugural weekend is an all-vinyl dance party helmed by MC-producer Fess Grandiose. Take a look at the full schedule of events for the weekend below—all of them are free—as well as photos of the new room. Thursday, May 14: Midwest Action presents a night of acoustic music featuring Joyeux, Matthew Kennedy, and Jesse W. Johnson (9 PM). Friday, May 15: Body Rock, Fess Grandioise's all vinyl dance party (10 PM). Saturday, May 16: Mako Sica, Naan Violence, and Plastic Crimewave Syndicate (9 PM). 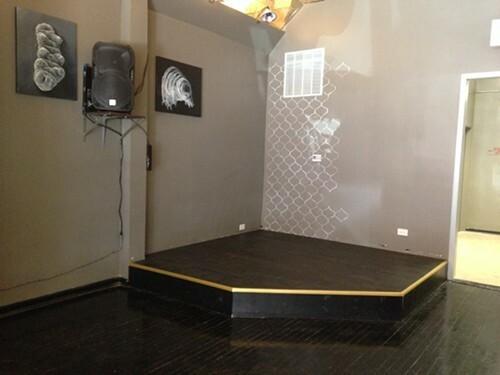 Cafe Mustache's new stage; the art on the walls is the handiwork of Matt Hilker. 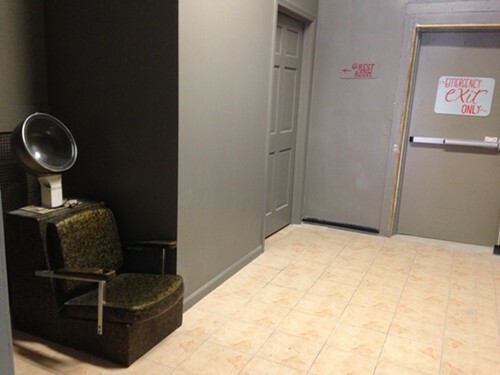 The area behind Cafe Mustache's stage leads to a bathroom, and it holds a remnant of the old salon that previously occupied the space.